TWO workshops One-Sock Tree & Where Does Love Live? LENGTH OF WORKSHOP: 2 hrs. The lonely one-sock will be used as a jumping off point to inspire contemplation of loss, love and all things left behind. Ms.Noyes will use music, dialog and characters from Ms Enz’s Fractured Hearts and Lurid Details to explore the Heart acknowledging and opening imaginations to infinite possibilities of connection. The lonely sock. The sock that lost its mate. Your favorite pair or an old gym sock abandoned unexplainably. Everyone has one of these. Some have a drawer full, hold outs for hope that their match will reappear. The lonely one-sock will be used as a jumping off point for this workshop to inspire contemplation of loss, love and all things left behind. We will use authentic movement, spontaneous writing, drawing and meditation to illuminate the un’known with humor grace and compassion. This workshop is for adults of all experience levels and abilities. Wear: Loose fitting clothes you can easily move in. Bring: a lonely one sock a notebook and writing utensil. Your socks will be joined by socks sent from around the world. We are never alone! During the workshop we will create a tree of everyone’s one-socks. This will be on stage during the performance of The Family Plays. 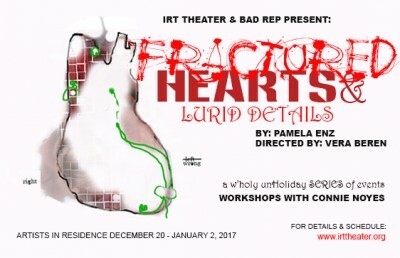 In this workshop we will use music, dialog and characters from the play by Pamela Enz, Fractured Hearts and Lurid Details*, to explore the Heart. We will create costumes to restrict and expand movement, explore the face of the character (mask)and underlying motivations. We will work with objects to expand perception. Where does love live? will use authentic movement, repetition spontaneous words and making to get curious about our fears, longings, upsets and honesty, acknowledging and opening our imaginations to infinite possibilities of connection and LOVE (of course) “In the end the shadow is transparent”. Connie Noyes’ interdisciplinary art practice examines social constructions and assigned values of idealized beauty. By transforming found, forgotten, discarded or worthless materials and identified sites into highly valued objects or socially acceptable gathering spaces the worthless becomes seductively rich. Initial perceptions of beauty are questioned as the history of what lies beneath the surface is both revealed and disguised. Through actions both in the studio and on site, the question provoked is: what constitutes beauty and worth? For Noyes inspiration is found in materials, in her innate curiosity and the act of making. As an urban dweller, she uses her studio and the city itself as source material; debris swept from the studio floor, collections from dumpsters or items disposed of by others on a street corner. To launch a new project, she begins with an exploration of available materials with no preconceived ideas of what she will find. Something always comes from nothing. It is the surprise of the unknown which intoxicates. Born in Washington D.C, Noyes is an interdisciplinary artist currently living and working in Chicago. She received her MFA from the School of the Art Institute of Chicago and MA degree in Psychology from Notre Dame de Namur University in Belmont California. She was awarded the Al Smith Fellowship from the Kentucky Arts Council and has received numerous professional development grants. Her work has been exhibited both nationally and internationally in places such as San Francisco, Paris, London and Innsbruck, but most recently at the 3 rd Biennale International d’art non-objective in Grenoble, France. She has been selected for numerous international artists’ residencies, some of which include the Emaar International Art Symposium in Dubai, Thupelo International Workshop in Cape Town, South Africa and the 5th International Visual Arts Symposium in Monastir, Tunisia. This year (2016) she will be in residence with Salwa Zeidan Gallery in Abu Dhabi in connection with Art Abu Dhabi and at IRT Theater in Brooklyn, NY. Noyes work is also in a number of corporate, private, and museum collections including that of, The Museum of Contemporary Photography in Chicago, The Ekstrom Library of Photographic Archives Special Collections in Louisville and the Greenville County Museum in South Carolina. Her project, Under the Freeway, was chosen as a featured project for Chicago Artists Month 2015 – The City as Studio.